Another month is in the books for our Silk Cotton Villa adventure. Another week gone working on projects. Guests start arriving in a little over a week. No project work while guests are here. One reason we have been steady at it for some time now. What happened when I unplugged an extension cord last week. I don’t like electrical work – never have. But will do it when necessary and within my knowledge and skill set. 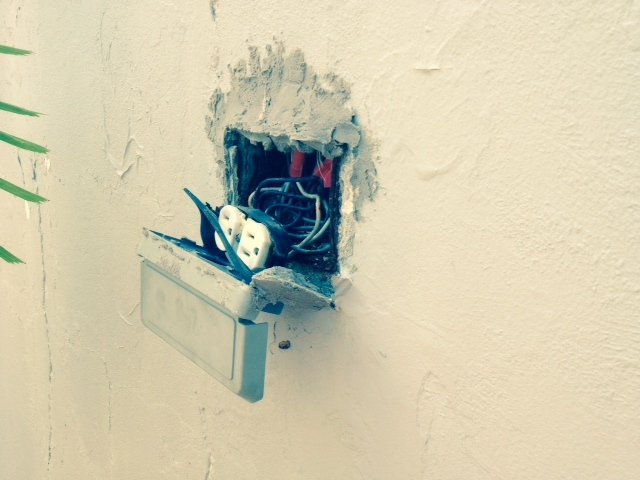 We had two outdoor outlets that were in dire need of repair. The environment here had literally turned the electrical boxes into rusted metal flake. Nothing left to hold the outlets in the boxes. And the outdoor covers were dated and needed replacing, too. So, that project got about 90% completed this past week. And, it is turning out nicely. Still some finishing work to make them look nice on the walls. Should wrap this one up later this week. More photos below. No photos on this one, but another electrical issue. Had some lights at the front door foyer and kitchen area that were not working. After some trouble-shooting, testing, replacing bulbs, etc., we discovered we had three bad switches. Replaced switches and all is fine now. Things just wear out in a rental property – especially in this ocean/island environment. Constant TLC needed. Helps to be handy in this lifestyle. We have two very large arched wooden doors located at each end of the pool patio. A few weeks ago it dawned on us that they could use refinishing. They were both very, very dry from the elements and don’t appear to have been refinished in quite some time. These got on the “To Do” list this past week. 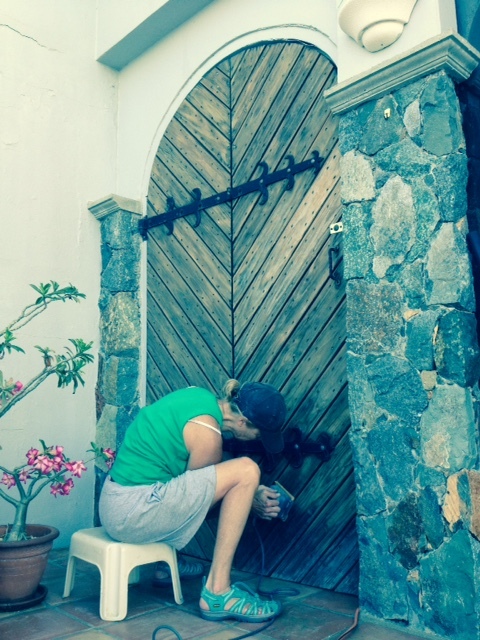 Sharon started working on these this past weekend – sanding and scraping – while I worked on the outdoor outlet project. She’s a VERY good refinishing prep lady! I joined her in the application of the stain step and we got that part knocked out, too, before the weekend ended. Now, just have to let mother nature dry them before a protective coating is applied. With the humidity here, drying takes a while sometimes. More photos below in the Gallery. In between, we worked on several smaller projects like weeding potted plants and putting down a weed-block layer and then put the finishing layer of wood filler on the rotted out area of the Pergola beam (previously discussed). Now, once that final wood filler coat is sanded, we can move on to pressure washing the Pergola and getting it painted. This entry was posted in Caretaker in the Virgin Islands, Project Lists, Property Caretakers, Working Couples Jobs on September 30, 2014 by Richard Arnold. This time spent working will only make the time pass faster. I am so impressed at all the projects you two are taking care of! Hang in there, party time soon!